Move quickly and fearlessly, adapting your strategy where necessary. You are being asked to lay low and blend into the fabric of your surroundings. Things are not entirely what they appear to be at this time so simply say nothing and do nothing. Allow yourself the space and time to see things for what they really are. Alternatively Opossum is letting you know that the universe is working behind the scenes to fulfill your dreams. Be patient, allow things to develop, and trust that you will know the exact moment to make your move. Take a passive stance in all that is happening around you. You are highly intelligent and prefer to use your brains and your wits as opposed to your physical strength to get what you desire. You understand the use of diversion and strategy in all situations. You have a habit of coming out of nowhere to step into successful situations. Most people never see you coming until it’s far too late and you have won the game. You are known as a very sensible and down to earth individual by your peers, work well in group situations and tend to rise to the top inconspicuously. As career choices go you make a great magician, strategist, publicist or stylist. To dream of an Opossum signifies a person or situation in your life where someone or something is being deceptive and not coming from a place of truth and integrity. Things are not what they appear to be so be on the look out for hidden agendas, self deception, deception, misunderstandings and half truths. Are you being dishonest with yourself? I recently had a dream where i was crawling through a vent with a flashlight. I made a left turn through the vent, and came across an Opossum with four baby Opossum in the pouch. It wasnt aggressive or anything. Just strolling past me as i was going the opposite direction. What does it mean? What does it mean when seeing a dead opposum pregnant just about dead with one little leg coming out. It means that there will be unexpected opportunities for you and your entire family, including those already passed on. Most probably it means, that there will be a period of quiet, perhaps solitude but this is a time to really study and watch things that bring inspiration and joy and through this process a new you and new life will appear out of nowhere like a mirage shows up in the desert but you must keep forward and focused on beauty and that which you are called to teach. As I was leaving my house yesterday morning for work, a dead baby possum was laying directly in my path at the end of my front doorstep. That night, I had a very lucid dream of being inside my home with my front window shattered (glass everywhere) and the curtains in disarray. I looked out the window, and it was daylight with fair weather. However, when I turned back and looked into my home, the place was a wreck as if it had been ransacked by a burglar. With the possum and dream happening within the same 24 hours, I’m convinced I’m being told something. Does anyone have any helpful interpretations? Thanks in advance! I had a possum, young one, jump by my feet as I sat in my recliner, It scared me so I screamed, It ran where I do not know. My cat saw it and never acted like it bothered her. While on my way home are 4 am from a 12 hour shift, I saw a possum in the middle of the road. I swerved to avoid hitting it. After passing, without a bump (like if I were to run over something) I looked in my side mirror and saw nothing behind me. I turned around and drove past several times AGAIN..only to find nothing. Does anyone know what this might mean? Sounds like you’ve witnessed the natural grace of most animals that will render them invisible all of the time. Sadly, we Humans actually have to work hard, to re-aquire, bring up from the depths of our being, this natural grace; for what should be, for us, a natural reflex. Last week while working outside, I saw an albino opossum. I thought this was odd, since they do not come out during the day. Then a few days later, coming home after dark, I was walking to my door and there she was, crossing my path. I now feel as if this was a message to not let the concerns of others determine your personal purpose. It is hard enough for me to keep above the constant pull towards a downward spin and when someone throws their fears, concerns, anger and just plane ol’ junk on my to-do list, makes for an unpleasant nights sleep. However, like the opossum, if I allow myself to be free enough to let go and allow the Universe to work on my behalf, understanding that I do not have to be the fastest, strongest or even the smartest person…I will eventually get there. I saw an opossum over a week ago, maybe two now. I didn’t think too much of it at the time. I saw it at 11:11 pm while walking and s/he came walking out of a nearby bush. We locked eyes 👀 for what seemed like a minute and then it silently retreated back from where it came. I continued on. What does it mean to dream of one horned goat? In competitive wrestling you are taught very early one that your first attempt at a Takedown, at anything at all, won’t work. Your second one won’t work either is your opponent knows what they’re doing. Your third, fourth and maybe even 10th attempt will probably fail. It is constantly trying, constantly pressuring, each time something different than the last that will lead to victory. Opossum speaks to me of this way of living. Opossum is not the fastest, the strongest or even the most clever. Perhaps that is why we do not hold her in as high esteem as we do so many other animals. But Opossum never stops trying. She is always trying something new. Sometimes that’s all that there is to life. There is always going to be someone stronger than you, faster than you or smarter than you. But if you remain adaptable and determined, you may fail. You may fail again. But you will almost certainly succeed eventually. Open up your mind and allow for more than one possibility and, like Opossum, you need not be the fastest, the strongest or even the smartest. In reality Darwin never did write about survival of the fittest. He wrote about the survival of the most able to adapt. About two weeks ago my cousin Bobby died. I had not heard the news that he passed when this happened. I live in on the second floor in a condo and it was just turning dusk. I went out on my balcony, as I do often. There is a large branch that runs 2 feet in from of my patio. I opened the door and there was the sweetest looking possum sitting on the branch. It was beautiful. I hurried back inside to get my camera went back out and took several pictures of it. Flash whatever it did not budge, just sat and stared at me. After about an hour I went back inside and after another hour went back out and to my amazement, it was still sitting there staring at me.Then a friend arrived and the possum slowly walked away. Shortly after that the phone rings and I get the news that my cousin had passed. I can’t help but connect the two happening. The possum has not been back and somehow I know it never will. He was the possum. What a beautiful connection that you experienced. Thank you for sharing. We are all connected. Plants…animals…each other. Always have a back up plan. Be agile and ready to deal with surprises and changes. Change is opportunity. Ok, I work nights, and this morning as I was driving home I saw a possum in the road. It was standing by the edge of the road, its head closer to the edge of the road than its rear, and was facing down the road. It turned, facing the middle of the road, looked at me, turned on around completely facing me, and then walked of the road at an angle toward me. I didn’t think anything of it, there are a lot of possums in my area. However, after traveling about one mile on down the road I saw what looked like the exact same possum, standing the exact same way, and did the exact same thing. It was honestly like replaying a video. I’m really freaked out right now. I’m sure there is some meaning behind this, I just wish I knew what it was. Sounds more like what’s becoming known as a ‘glitch in the matrix’ or time loop sort of event. You’re not alone. Woke up at like 3:30 this morning to noise in my cabin. Apparently a juvenile or recently seperated youngster opossum decided to come in through my broken screen and pay me a visit. He kept hinself hidden well, enough so that I began to believe that perhaps I had a mouse or rat sneak in. Well was kaying here with the night light on and had just lain back down. When I saw movement in the corner coming out from behind the tent bags. He couldn’t have been but about 2 foot long including his tail. Now, had recently been seeking guidance, as I had lost my job back in october, had trouble getting the part time job I have now, and have been tossing around the idea of trucking for several years now. My question of guidance is that I have several family members whose health has been on the decline, so had asked my deceased grandfather for advice. Well, that night had heard the sound of trees rubbing against the walls, but no trees are close enough to do so. Then same night heard the porch swing chains groaning, though it was not moving. Needless to say was a little freaked as if it were my grandfather, then this would be my first answered request for a visit, but knowing what I know of the occult and bad spirits, I know they tend to answer when a person is being open like I was. So I said, aloud as I grew more apprehensive, “grandpa, if that is you, you are freakin me out.” It stopped rather abruptly. Now, two or three weeks later, I have this visit, so I am trying to ascertain if this is an omen and if so what is it trying to tell me. 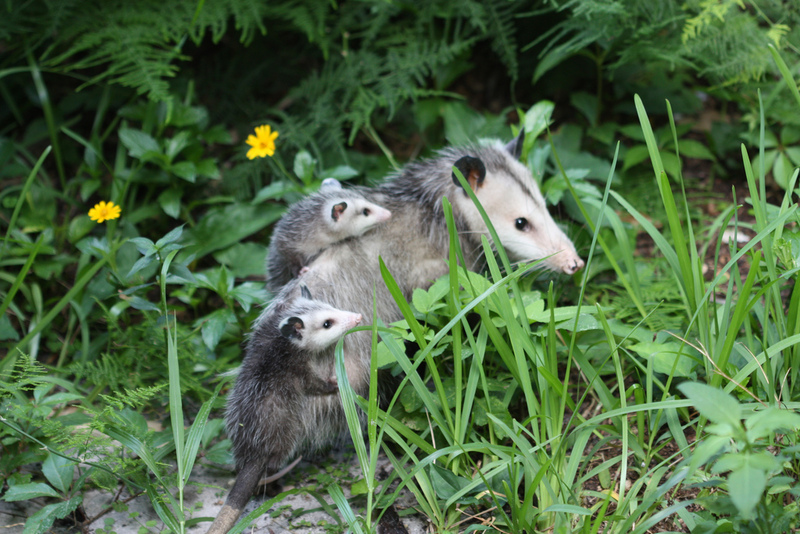 I have grown up with opossums always roaming around my yard. I named them all Steve just because it is easier, there are so many. I have grown to really like them and enjoy seeing them at night. This morning on my way out, on the bottom of my front stairs, there was a dead baby. How my dog didn’t find her first when we went out still baffles me, my dog knows where every snake in the yard is the minute she walks outside. This was the first site I found a meaning and tried to ‘lay low’ today. My day was probably one of the most unfortunate days I have had in a very long time, I am not sure what message I may be missing from deceased baby Steve. Just moved. Caught up on the opossum that came every night around d 11:00 pm. Then for a few nights, he didn’t show up. Found him dead run over by a car a few days later. He seemed pretty savvy of crossing the road the first time I had spotted him. It will be okay, just remember with death comes life. This too should also remind you of their nocturnal ways and strategic approaches to surviving, especially moving about at night in efforts to supply for their family as well. Just remember, not ever get too comfortable in that routine just in case you decide to cross the street, or make a decision, in which the outcome will remain the same. Expect the unexpected therefore, you can use your stealth and divert whatever change you may not see coming. Although, you may take this path every single day. Be aware and stay alert. nasty ratty looking possum under my house for months. tonight it was up in a tree hissing and snarling at me viciously as i walked by. sorry folks but i cant risk being attacked by a crazy nasty possum. i shot it out of the tree. i feel bad for it but it was acting very agressively and i felt seriously endangered. i’ve apologized to its spirit for having to do that. So yesterday I was driving on a freeway and my car started to smoke thru the dashboard. It got worse really quickly, I had to get out before it came to a complete, dead stop. Once the totally burned up, burned out car was on the tow truck the driver showed me a charred opossum that had dropped out from under my car. Guess it had been tucked up there the whole time. It passed it’s medicine on to me. Lots to integrate and contemplate. I awoke to walk my dog this Christmas morning and saw a huge possum waddling down the sidewalk being chased by black cat. I intervened, the cat ran away, the possum got away. I wonder what this means? Oh my goodness! That is crazy! Glad you are alright. THAT would have freaked the ~ everything out of me. in the city in a busy neighborhood. Glad you’re ok, and braver than I am around creatures and critters. That’s great! It is very traditional for a totem animal to test the shaman to see if they are worthy! Might you be shamanic? Are you being called to acknowledge your abilities? Sounds like you suffered no serious harm, happily, I think it was just marking you! Fix that pet door anyway, lol! On two occasions in the last two weeks I have felt an animal jump on my bed whil I was half asleep. It happened this morning again. I knew instinctively that it was not a cat. I do not have animals. I saw an opossum in my head. I felt it about my feet. I struggled to scream for help. I finally woke up and forced myself to look at the foot of my bed. There was nothing there. Next time, I will try to not be afraid. Testing the shaman? How interesting! Many possums have appeared in my path throughout my life, injured or orphaned, & I have always rescued them. (Incidentally, they’ve never been aggressive with me either; the most aggression directed towards me was a slowly dying mother, who only hissed a little initially as a weak/halfhearted show, & not for long, as she very passively allowed me to collect her off of the road & take her home.) The energy expression of opossum seems to be a deeply rooted part of my personality. We have a re-visiting opossum who frequents our trash bin. I placed the container on its side so the little fellow could be on his way. He ate some old Little Ceasar’s pizza and breadstix. This meaning speaks to me. Thanks for posting it. I would like to tell you what happened to me last night. Now I have seen many possums in passing and usually just watch them go along their way. However, last night was something way different. I took and offering outside to give to the earth in exchange for allowing me to harvest some of the tree to make my own mortar and pestle and a few other things. I spoke to the tree and explained what I needed. I then began to saw it. I heard something wrestle around the area but my flashlight revealed nothing. The next thing I know I looked to my right and there is an opossum right next to my face . Not even a foot away. It did not hiss or growl. It simply stood there and looked me dead in the eye. I said hello and walked inside. My husband came to help then gave up and went back inside. When this happened the possum came back yet again. What is the meaning behind this encounter? About a week ago I dreamed that I rescued a baby possum that was all alone, and adopted it, even though my friends and family couldn’t understand why. Then last night, I was sitting on my front porch and a small possum came around the corner of the hedge. That was a first view of one since we moved to Texas from Virginia. It was only a couple of feet away from me. Any thoughts on any sort of significance to this otherwise totally random experience? 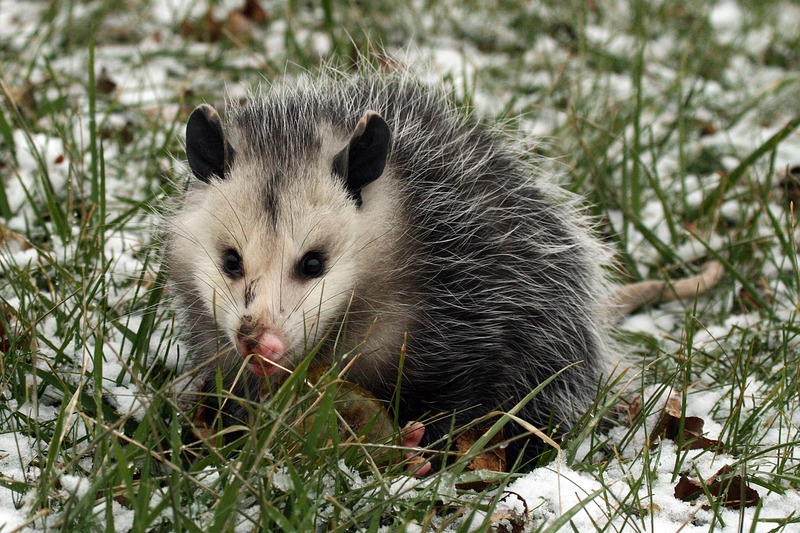 Had a dream that I saw an opossum walking around in a construction site and it let me pick it up, it had babies in the pouch and I was walking around with it carrying it like a baby trying to find a safe place for it and found some trees, laid it down and it dissappeared. Does this mean anything? Two possums walked across a path we were walking on completely at ease. One stopped to go to the bathroom. They looked at us and carried on. What is the meaning do you think? Last night I dreamt that my estranged friends sister and I were at the lake with friends, jumping from cliffs into the water. It was great fun, and a happy dream. Suddenly she found a tiny orphaned baby opposum, and it was a helpless suckling. I took it into my care, I had it in my pocket, and I was making my way back up a hiking trail when I saw a mother opposum and another baby with it. I tried to give her the baby back and she became agrees dive and hissed, continuing in her abandonment. So I became its mother. I went and got formula and a tiny bottle to nurse it with. Hi, I am a middle school student in Idaho, and I want to ask permission to download of an opossum that appears http://www.spirit-animals.com/opossum/. I would like to include it in a school assignment, thank you, Usbaldo. The best place for you to find what you are looking for in images is through this website: http://search.creativecommons.org/. Do a search for Opossum there and make sure that you check the appropriate boxes for what you need. Most of Our images do come from the Creative Commons – however we are upgrading to purchased images so Not all of our photos are still available. Hello, I am a middle school student in Idaho, and I want to ask permission to download of an opossum that appears http://www.spirit-animals.com/opossum/. I would like to include it in a school assignment, thank you, Usbaldo. 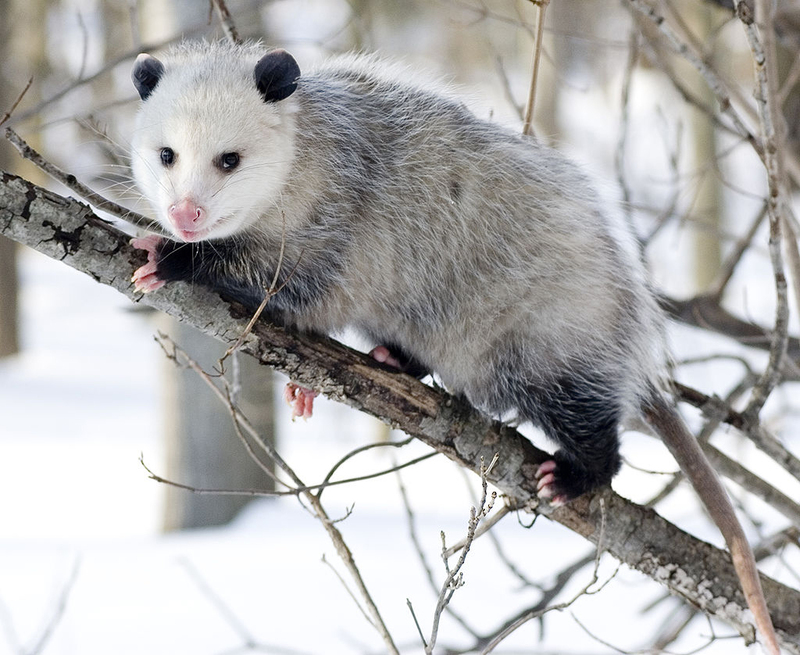 Hello, I am a middle school student in Idaho, and i would like to ask permission to download the picture of an opossum that appears http://www.spirt-animals.com/opossum/. I would like to include it in a school assignment. Thanks you, J.C Camarillo. Your rat bait killed the possum.